Shop our selection of men's cycling bib shorts are great for a variety of weather conditions and feature renowned brands. The HC range has specifically been designed to be a combination of performance function and style! We have selected a top end gel chamois for the Le Col HC Cycling Bib Shorts, giving you unrivaled comfort mile after mile! New laser cut bib straps sit flat against the skin for maximum comfort. 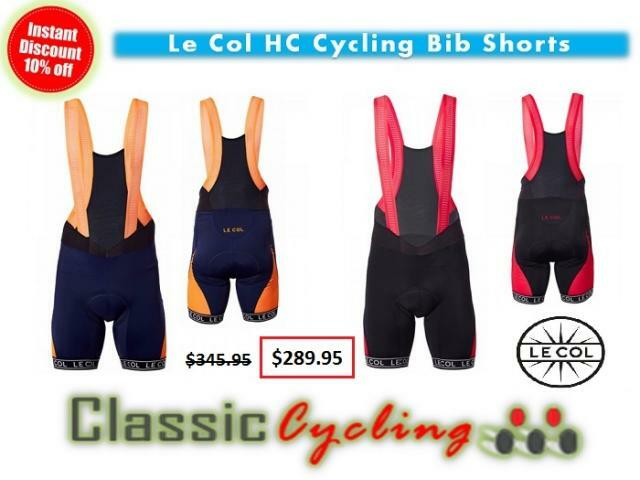 If you have never tried the Le Col HC Cycling bib shorts they are an excellent way to test the quality and value. While the design is cleaned and subtle the workmanship is first class. If you know what to look at attention to detail is everywhere with the Sport bibs. For instance I am sure we have all had those pesky logos crack and peel off of past bib shorts. Not with Le Col. All logos are embroidered on. All other aspects of the bib shorts, Italian materials, Italian manufacturing, and Italian chamois are all top notch. The Le Col bib shorts offer unrivalled value for money!